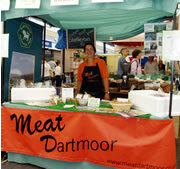 Below is a list of regular markets attended by Meat Dartmoor Members. If you are looking for something specific please check with the member/s who attend the market beforehand. - every Thursday Held near The Globe Inn, town centre, Buckfastleigh, 10am till 1 pm. Contact Russell Ashford for more details. This succesful market runs from 10 am until 12 am in the Village Hall. Sue Martin or Annabel Caunter are there most Saturdays, ring her for dates and to order for collection on 01822 880223. Other items available include vegetables, bread and ecover products meaning you can do your weekly shop here and enjoy the coffee and cakes aferwards. Wells Market Wild Beef attend this market Wednesday weekly. Taunton Market Wild Beef attend this market Thursday weekly. Borough Market (London Bridge) Wild Beef attend this market Friday and Saturday weekly. Wild Beef attend this market Saturday weekly. Chagford Show Visit the Show's website on www.chagfordshow.co.uk . Watch this space to hear which of our producers will be attending.